Glen Campbell: What is APRS? APRS is the automatic packet reporting system; it’s a method of tracking ham radios that are equipped with a GPS unit (as many mobile systems are these days). At its simplest, an APRS-enabled radio will broadcast a digital packet containing its position (obtained from the GPS), usually on a scheduled basis (for example, every 10 minutes). Other APRS-enabled radios will received that packet and will be able to track the location or navigate to it. Receiving stations might also have an Internet gateway and be able to consolidate or map the information received, thus showing (in near real-time) the locations of all the enabled units. In a disaster-relief situation, this could be crucial to be able to track the location of the various remote units. It’s also handy if you’re just camping or merely out roaming around and want to know where someone is. In addition to reporting your position, the APRS protocol permits the sending and receiving of brief messages, sort of like a text message or SMS between ham radios. In a disaster situation, where power and normal communication may be unavailable, it allows the interchange of information between rescue coordinations and others involved in the relief effort. My primary handheld device is APRS-enabled, and I sometimes keep it on while I’m driving around town. You can track me at aprs.fi, one of the more popular APRS mapping sites available. This is a screen shot of my location yesterday evening. 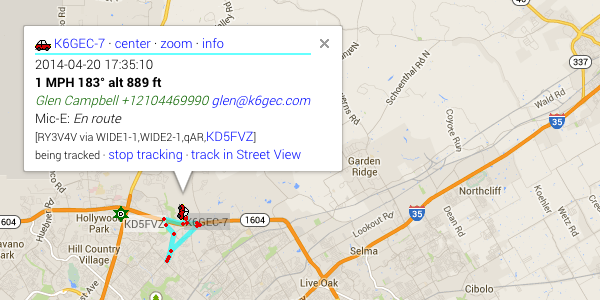 If you have APRS on your rig, send me a message!